See links below for podcasts and articles about Toxic…. 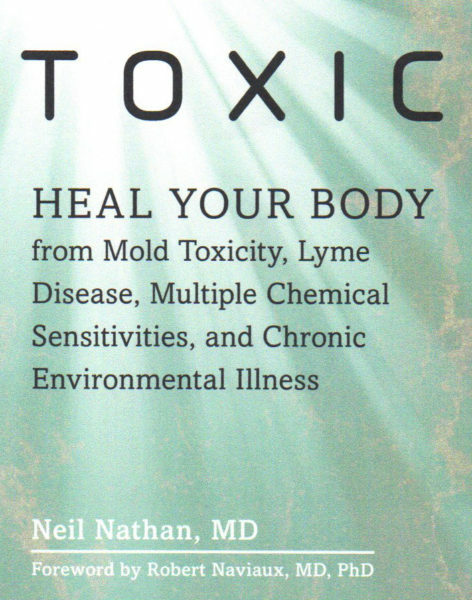 Dr. Neil Nathan’s book, Toxic—Heal Your Body, fills a critical niche in the evaluation and treatment of patients with mold illness, tick-borne illnesses, and chemical sensitivities. This is one of the most difficult, and widely misunderstood, areas of medicine, yet critical to so many patients in need. Dr. Nathan brings a clinical experience and expertise that is unmatched when it comes to multiple chemical sensitivities. If you are a patient with these problems or a practitioner caring for such patients, this is the most important book you will read this year. Although this line was used to describe the French Revolution, it fits perfectly into our modern life. We are seeing an epidemic of diabetes, fibromyalgia, immune illnesses, environmental illness and Lyme disease. These are creating challenges that our current healthcare system is ill-equipped to deal with. Not because of lack of effective treatments. But rather because of a dismal lack of physician awareness and education. This leaves so many people having to be medical detectives, to learn how to solve the puzzle of their own health conditions. The Internet provides an overwhelming amount of information, with a little bit of it even being accurate. But even for this, there is precious little perspective being given. Now there is a book that can save you thousands of hours of investigative work. It will also help you reclaim your health and vitality! I have long respected Dr. Neil Nathan’s ability to take incredibly complex areas and protocols from numerous different physicians, develop a comprehensive understanding of them, and then put them into a simple organized form that can be applied by both people with health conditions and physicians. I have learned an enormous amount from him. In his newest book, he does this comprehensively. He organizes and simplifies toxicity, Lyme disease, multiple chemical sensitivities, and literally dozens of different health topics. And he does this in a way that can help you get well. Know how you call tech support, and the first thing they do is ask you to reboot your computer? That is kind of what it is like with your body. In Toxic: Heal Your Body, Dr. Nathan teaches you how to reboot each of your key systems. This also includes your immune system, endocrine system, gut, and numerous others. Got multiple chemical sensitivities? This book will help. Sensitive to everything? This book will help! Thyroid, adrenal, or other hormonal deficiencies? Horrible digestive problems? Weight gain? Simply feeling toxic? Suffering from illnesses of modern life? All of this is integrated in this incredible new book. An added bonus? He also teaches you how to reboot your emotions and your soul. Remarkable work for a very focused science-based researcher, who also was blessed with a loving heart and a great soul. Dr. Nathan organizes the complex work of countless researchers, and makes it simple. This way you can understand and apply the information –NOW! – Jacob Teitelbaum MD, bestselling author of From Fatigued to Fantastic! Christmas Has Arrived Early This Year! “Mold & Mycotoxins: Current Evaluation and Treatment 2016” is a unique opportunity to learn about the evaluation and treatment of mold illness from one of the top doctors in the world with a focus on complex, chronic illnesses. The author has been one of my personal heroes for years; not only for his knowledge but also for his compassion and commitment to seeking answers to improve people’s lives. The book allows the reader to see how Dr. Nathan approaches recovering health in some of his most difficult cases. I was anticipating this book for months, and it did not disappoint. If you have experienced mold illness, this book is a must-read. If you have Lyme disease or another chronic condition, the book is still a must-read as mold is all too commonly a component of many complex conditions. Ask your doctor to read it too as it will only help them in caring for their patients. The strategies outlined in this book are in large part responsible for my own health recovery from both Lyme disease and mold illness. Christmas has arrived early this year with the gift of Dr. Nathan’s new book! #1 New Bestseller NOW Available!! Millions of people are suffering from chronic illnesses that, unbeknownst to them, are caused by exposure to mold, Lyme disease, other infectious agents, and other environmental toxins. Millions. Because the symptoms of these illnesses are so varied and unusual, many of these individuals have sought medical care only to be dismissed, as if what they are experiencing is “in their head.” Many (if not most) have tried to tough it out and continue to function without hope of improvement. Unfortunately, their illnesses are very real. Toxic is a book of hope for these individuals, their loved ones, and the physicians who provide their care. Over many years of helping thousands of patients recover their health (even after their previous doctors had given up on them), Dr. Neil Nathan has come to understand some of the most common causes for these debilitating illnesses, which allows for the utilization of more precise and effective forms of treatment. Our thanks to Lonnie Marcum for a great book review at LymeDisease.org. Millions of people have sought medical care, and found that they have hit a wall with their doctor even though they feel very sick. There is an epidemic of tick born illnesses (Lyme Disease), mold exposure, chemicals and other toxins that are causing illness. Unfortunately, these illnesses are falling through the cracks in our health care system. Dr. Neil Nathan is discussing his book “Toxic”, which is a easy to read, but thorough journey through these toxic illnesses. In this episode, you will learn about healing your body from toxic illnesses such as Mold Toxicity, Lyme Disease, Multiple Chemical Sensitivities, and Chronic Environmental Illness. In this episode, you will learn about mold illness, cell danger response, mast cell activation, and much more.